SINCE Christmas, a string of violent assaults and robberies have taken place on the streets of Limerick city’s nightclub hub. But in the past month, reckless gangs of youths and armed individuals have taken this behaviour from the street into restaurants, cafes and shops in the heart of the city centre. That’s according to gardai, who are now tackling the surge in street crime with high-visibility garda patrols and a number of arrests. In January 2017, Limerick was awarded the prestigious Purple Flag, recognising its excellence in managing its evening and night-time economy. And now, following a spate of robberies and attacks, leading retailers are calling for unity in stomping out this rising trend. Last Wednesday, two men entered the Fine Wines store in Corbally, with their faces covered, and fled in a car with a sum of cash. This was the second time since December 9 this store was robbed. In March, there were at least nine major robberies in Limerick city, a number of which included armed children, aged under 12. Four weeks ago, a lone man entered Be Fabulous fashion store on Catherine Street, and threatened a staff member with a gun, demanding cash from the till. “He was basically walking up and down the street, keeping an eye to see and get a chance in somewhere, and just came in, and pulled the gun and wanted the money. The girl that was working said that he wasn’t getting anything and that she was ringing the gardai, and he took off,” said owner Will O’Brien, who was told that the individual was later arrested. Mr O’Brien said that the culprits are not deterred by CCTV signs. Catherine Street retailer Shane Gleeson said he is aware of four gangs in the city who “are all underage”, and as young as 13. He said that he has witnessed people “being trained to steal before they could walk”, and that a lot of the shoplifters he knows are “sons and daughters of previous shoplifters, and even grandchildren of previous shoplifters”. He said that young offenders are “are very quick to use violence. They are very quick to say: ‘You can’t touch me because I am 13 or 14.’ You will be aware, I am sure, that they have produced a knife, they have used weapons, they have picked up sticks to attack staff. "It’s not as if it happens every night or every day or every week, it does not, but it’s still something that they are quite willing to do. And it’s disturbing when you are attacked with a weapon, and to see that child back on the street after a week or two, your staff are asking ‘What’s going on?’ These children have followed staff to their houses,” he explained. Mr Gleeson has praised the gardai and Supt Smart for their increased patrols, under Operation Mierle, and is calling on all retailers to work together. Marcella O’Neill, manager of Mace on Upper William Street, said that they once experienced gangs of youths stealing from the shop. But after linking in with the gardai, she said her staff feel more “reassured”. “Sometimes they tell us what’s happening, because sometimes you can feel alone and no one is doing anything. But once you know they are proactive and coming to terms with this, it makes it easier for us,” she added. One retailer said that one incident involved a gang of youths robbing a store on O’Connell Street, then proceeded to drink wine outside a fast food restaurant with one individual throwing gym barbells onto the road. Anyone with information in relation to these incidents is asked to contact Henry Street garda station at 061 212400. March 28, Fine Wines on Corbally Road: At around 7.30pm, two men enter the off-licence, both had their faces covered and demanded cash from the till. They fled the scene in a silver two-door Opel Corsa with cash. 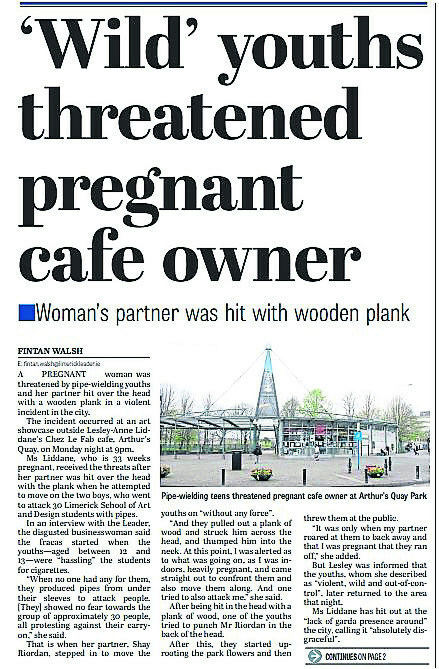 March 26, Chez Le Fab, Arthur’s Quay: At around 9pm, two boys, armed with pipes, attacked a group of 30 students and later threatened the owner of the cafe, who was 33 weeks pregnant at the time of the incident. This was after her partner was hit in the head with a plank of wood and punched in the neck. It is understood that youths also targeted local fast food outlets at the time of the incident. March 26, off-licence in Penneywell: At around 9pm, a lone man threatened staff at the premises, removed money from the till and fled the scene. March 26, Centra in Caherconlish: At around 1.30am, entry was gained from the front of the premises and a large sum of cash was stolen from the safe. The criminals fled the scene with a large sum of cash. March 25, petrol station in Cappamore: At around 2.30am, the front shutter was pulled up and a window was smashed, resulting in a significant amount of property being stolen from the premises. March 20, McDonalds in Castletroy: At around 2.50am, a burglary occurred at city restaurant in which a digger was used to break into the premises. According to gardai, the male culprits gained access to a rear office and an attempt was made to leave the premises with a safe. However, they were unsuccessful and fled a short time later. The restaurant was extensively damaged and a major garda investigating is continuing. March 20, licensed premises on Henry Street: At around 12.30am, an individual or individuals entered the premises through the cellar door and the premises was then ransacked. A quantity of cash was taken. March 19, off-licence on Church Street: At around 9pm, a lone man entered the premises and made off with a sum of cash after he threatened staff with a sword. March 12, fast food restaurant on O’Connell Street: One child, understood to be 13 years of age, was arrested in possession of a knife. He is believed to have attempted a robbery on a fast food restaurant on O’Connell Street. Three incidents at separate establishments since that Sunday saw one Centra staff member being hit repeatedly with a sweeping brush, while a knife was brandished at another Centra store and the fast food restaurant. March 12, Russells Bar in Dooradoyle: A violent incident during which staff at a pub in Dooradoyle were threatened by a number of armed and masked intruders. Two males entered the licensed premises and approached staff. Both men were carrying weapons,” said a garda spokesperson who added that the culprits were also wearing balaclavas to hide their faces. The staff members, who were assaulted during the incident, are said to have been traumatised following their ordeal. The extent of their injuries has not been disclosed. March 9, restaurant in Thomondgate: At around 10.40pm, the owner of restaurant was threatened after one, of two, young men went behind the counter. The injured party was then assaulted by one of these males. February 17, Maxol filling station in Dromkeen: At around 8.30pm, a man wearing a balaclava entered the premises with what’s believed to have been a firearm in his possession. He demanded cash from the till and fled with a sum of cash towards the rear of the premises. January 10, Bar One Racing on Quinlan Street: A man who had covered his face walked into Bar One Racing with a kitchen knife, he threatened the staff there and made off with a sum of money. December 30, shop on Upper William Street: Man, wearing wooly hat and scarf, attempted to take the till from the counter and when he didn’t succeed he threatened the staff behind the counter. December 9, Fine Wines on Corbally Road: At around 6pm, two males entered the premises threatening staff with a wheel brace. The assailants forced a staff member to open the till and made off with cash.